Over the last decade, Protection Engineering Consultants (PEC) has been on the forefront of research and development efforts focused on new bridge security technology, protective design guidance and novel protective system development. 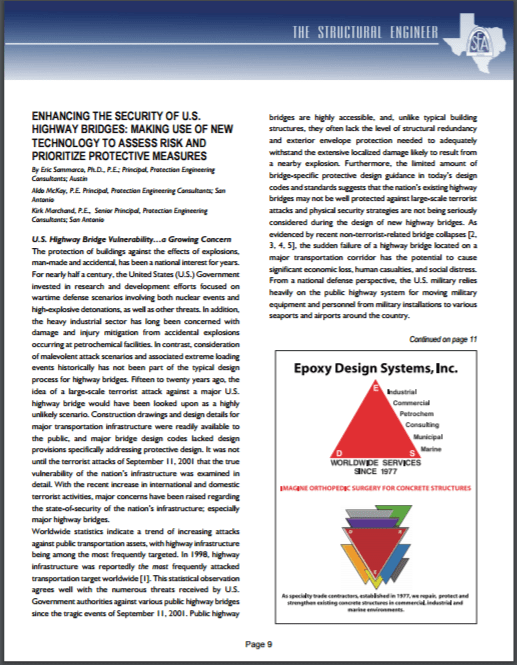 For a brief rundown of the state-of-the-practice and future initiatives in bridge security, check out our recently published article entitled Enhancing the Security of U.S. Highway Bridges: Making Use of New Technology to Assess Risk and Prioritize Protective Measures in the winter issue of the Structural Engineers Association of Texas (SEAoT) journal The Structural Engineer. With recent historical data indicating a marked increase in terrorist activity aimed at transportation systems, the vulnerability of our nation’s highway bridge inventory is becoming a growing concern. Public highway bridges are highly accessible, and, unlike typical building structures, they often lack the level of structural redundancy and exterior envelope protection needed to adequately withstand the extensive localized damage likely to result from a nearby explosion. As evidenced by recent non-terrorist-related bridge collapses in the U.S., the sudden failure of a highway bridge located on a major transportation corridor has the potential to cause significant economic loss, human casualties, and social distress. Read the PEC Publication by Dr. Eric Sammarco, P.E., Aldo McKay, P.E. and Kirk Marchand, P.E. For more information on PEC’s bridge security experience and capabilities, please feel free to get in touch with Dr. Eric Sammarco, P.E..